Editorial: Why would Ebrima G. Sankareh Veteran Journalist and Gov’t spokesperson Snub the media? You are at:Home»Editorial»Editorial: Why would Ebrima G. Sankareh Veteran Journalist and Gov’t spokesperson Snub the media? Gainako and several other media houses in the Diaspora were taken aback when veteran journalist Ebrima G. Sankareh hide away from the online media during President Barrow’s recent visit to the United Nations General Assembly in New York. Mr. Sankareh, a veteran journalist and founder of the online newspaper The Gambiaecho was appointed as Government Spokesperson in June 2018. He was sworn in July amid controversy that his appointment may have surprised the Director of Press and other government officials. Since his appointment Mr. Sankareh issued few press releases on behalf of government that were seen to not clearly represent the position or policies of the Barrow government. Mr. Sankareh is not only a seasoned journalist but was among the pioneers of the exile Gambian media who waged an uncompromising war against the dictatorship of Yahya Jammeh. He own and operated the Gambiaecho one of the leading online news outlets that consistently exposed the dictatorship of Yahya Jammeh and kept hope alive for Gambians. The Gambian media houses and journalists were the most battered by the dictatorship of Yahya Jammeh. The fraternity witnessed the killings of veteran Journalist Deydah Hydara, arrest and detention of several journalists, torching and closure of several media houses in the Gambia. But the power of the media and resilience of Gambian journalists led to the creation of a vibrant online media. This persistent media fight against one of the most brutal dictatorships in Africa among others is what may have led to the choice of Ebrima Sankareh as the government spokesperson. He was earlier rumored to have been the would be government spokesperson of December 30th coup plotters which was crushed by Yahya Jammeh. Ebrima was believed to have been waiting in Dakar Senegal for the success of the coup before he travels to Gambia to take up his position. Given synopsis of the role Ebrima played as a veteran journalists, his understanding of the history of Gambian media and the importance of the media as the fifth estate, it is inconceivable that he would find it convenient to snub the media. 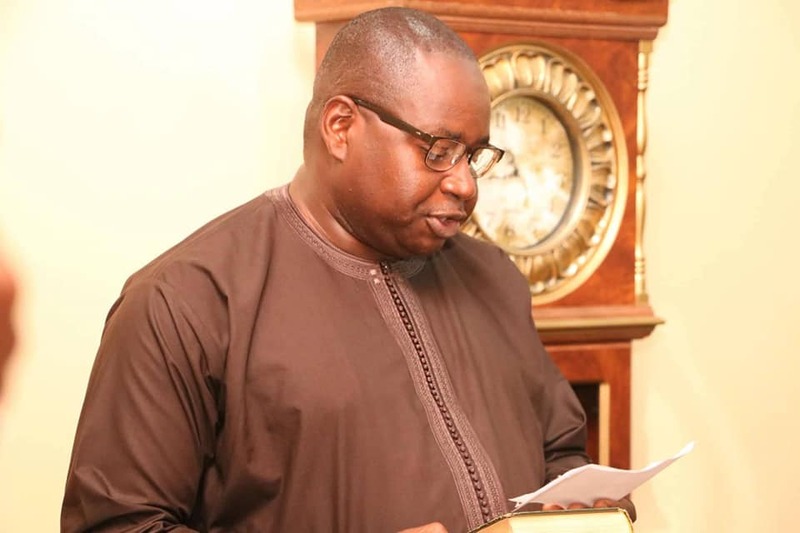 There is no question many were hopeful that the Barrow government which has struggled with communication has finally found someone who will help put its communication and information sharing in order. But the veteran journalist may have found himself in a compromising situation. There are only few points that may explain why Mr. Sankareh is not comfortable talking to the very online media he was a part of. It is either as stated earlier, he is not comfortable with policies and messages of the Barrow government or unfortunately he continuous to harbor ill from bitter differences he has had with his former media colleagues especially the Freedom Newspaper the Echo’s sister paper in Raleigh. If the later is true, it is regrettable that our most educated and privileged cannot get past their differences when they find themselves in public service. Gainako made several attempts to reach out to Ebrima Sankareh as government spokesperson during the President’s visit to the UN without success. Our editor who spoke to the minister of information requested an interview with government officials but was directed to contact the government spokesperson and rightfully so. Information minister Sillah was very respectful to our request but asked that we speak to Sankareh. He in fact shared Ebrima’s US number which was contacted several times through voice and text messages. To our surprise, other sister media outlets had for some reason given up contacting the government or it’s spokesperson for any interviews when they were in the United States. One would have expected that a veteran journalist as government spokesperson who has first hand experience on what it means to alienate journalists, interaction with the media would be different. We have been proven wrong unfortunately. Our questions to Ebrima Sankareh are simple and straight forward, why have a government spokesperson when the government appears to be afraid to face its citizens through the media and answer questions? What would the late veteran Journalists Deydah Hydara and Pa Dixon Colley think of their own journalist students snubbing the media because they are now on the side of government?. Wasn’t it Deyda hydara who said paraphrasing, If one is afraid of public scrutiny then one must never take up public position?. Mr. Sankareh, it would be a disservice to the media if you continue to occupy the position of government spokesperson and yet you are afraid to face the media and speak to them about government policies and processes. It would be a betrayal at the highest order of the media fraternity if the Barrow government continue to hoard information while veteran journalists occupy their positions at the state house. It is widely known that sharing information and communicating government policies to the general public is less than desirable. By now, a weekly or daily media briefings should have been the order of the day at the State House. Anything less, is an affirmation that our government is afraid to be transparent because it has something to hide from the public. You will also go down in history as one of those who was critical of government while outside, but decided to tag along while serving in a public position. The role of the media in any democratic society is unquestionable. The online media may now appear to be an enemy of the government but it was once in a life time the beacon of hope and source of daily information for many Gambians. Mr. Sankareh why are you snubbing the media as a government spokesperson? We await your response!